Yep, it was a long time in coming, but it’s here now. Poke around. If you’ve been around a while, you’ve likely ridden a steel bike or have heard the often quoted line that “if steel had just been invented, it’d be the miracle material for bicycles”. Like with anything, consumers are targeted thru marketing to encourage sales growth. Create the latest trend and you’re “golden”. There are many great applications for aluminum, Ti and carbon. Steel is no different. There’s a reason that bicycle ride qualities are still typically compared to the “feel of steel”. With a tremendous variety of steel tube diameters, thicknesses, lengths, alloys and heat treatments, the strength to weight ratio along with shock and vibration damping qualities make it a “no brainer” to use for custom bicycle frames. Lower material costs, ease of machining and repairability are bonuses. 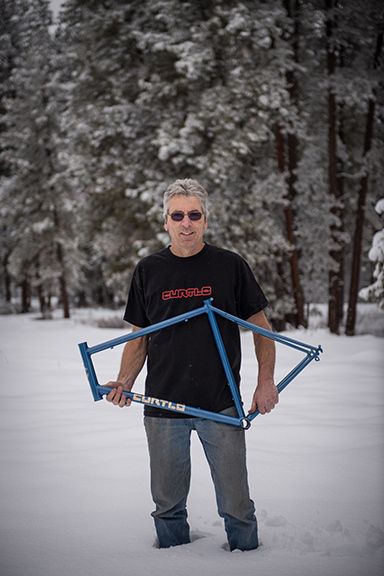 Over the course of the 40 plus years that I’ve been designing and building frames, steel bicycle tubing has made leaps and bounds in strength and durability. This has allowed for building lighter more compliant frames while significantly increasing frame life and performance. Steel bikes are alive and well. If you are reading this…chances are you already know that.